It’s years since I watched a Panorama documentary. The BBC’s long-running current affairs series used to be known for its hard-hitting programmes involving investigative journalism and controversial topics, and for all I know it still is. I was therefore a little apprehensive when I heard they were doing a piece about the Nepal earthquake called Disaster on Everest by a journalist who had accompanied a team of climbers to report on events at Base Camp. What would the BBC come up with this time? 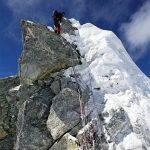 Another of those popular reports about how Everest has become a playground for rich tourists, who are happy to send Sherpas to their deaths as they wait to be carried up the mountain and enjoy a glass of champagne on the summit? I need not have worried, for this programme was about as hard-hitting as Andy Murray serving a few underarm lobs to his 93-year-old grandmother (I don’t know whether he has one). Depending on your expectations this wasn’t necessarily to its detriment though. If you were hoping for an incisive critique on the failings of the earthquake response, or scathing criticisms of guided climbers on Everest, this wasn’t a show for you. If on the other hand you were looking to get something else out of it, then there was much to enjoy here. For an incisive critique to be successful, both journalist and viewer need to have a good understanding of the subject being critiqued. Most viewers in the UK watching this programme won’t have visited Nepal, and fewer still will have been anywhere near Everest, let alone considered climbing it. A few will have read Jon Krakauer’s Into Thin Air, about a group of guided climbers who perished in a storm on Everest in 1996, and will have strong opinions about it. 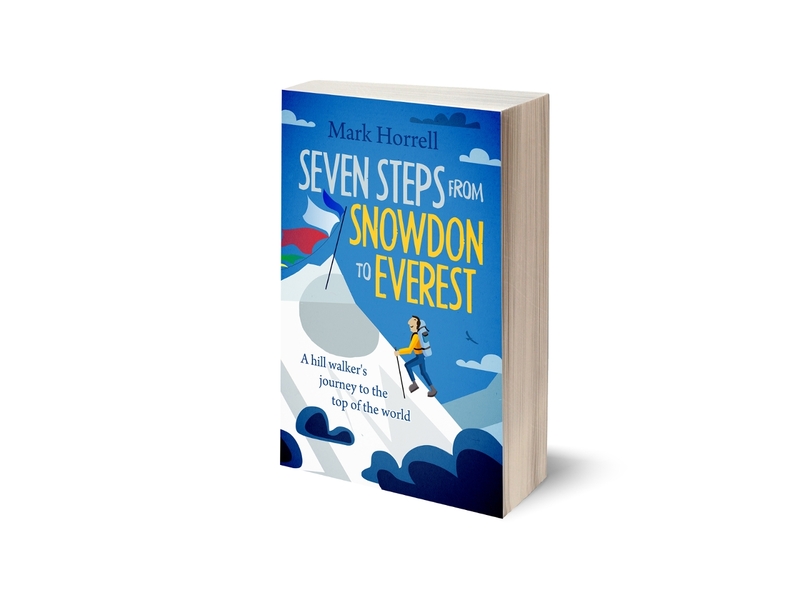 This one well-written and enjoyable book has been the catalyst for a whirlwind of Everest hate over the last few years, based on only a vague understanding of a complex set of issues. Rather than chucking a bit more petrol into this flaming vat of frothing bile by churning out another critical documentary, I believe it’s much better to do what the BBC did on this occasion, and produce a neutral programme that helps to give viewers a better understanding of Nepal and the issues its people are facing, allowing them to make up their own minds, rather than be steered down a route of strong opinions based on rudimentary knowledge. “This is the story of what happened to me on Everest and what I found in the country below,” says the journalist in question, Tom Martienssen, at the beginning of the film. And if you consider it that way, rather than as a hard-hitting documentary, then it’s actually pretty good. In any case if he wanted to produce a Krakauer-style exposé of inexperienced guided clients being ushered to their deaths then he chose the wrong expedition team to accompany. Instead of the wealthy 50-something lawyers and doctors of Into Thin Air he chose to travel with a team of Gurkhas, the British Army’s crack regiment of native Nepali soldiers, who were aiming to put the first serving Gurkha on the summit. One of them, Govinda Rana, had four tours of Afghanistan under his belt. “This challenge is different,” he says to camera, echoing the feelings of nearly every climber who attempts Everest. Let’s face it, nobody’s ever going to accuse him of being an incompetent loser who needs to be dragged to the top by Sherpas. Hopefully the Gurkhas would have had Tom performing squat thrusts before breakfast if he even thought of writing anything sneerily derogatory about them. But joking aside, if this were his aim he was very quickly disabused of any preconceptions by a cold dose of reality. He isn’t a mountaineer, but in the tradition of James Morris, the Times journalist who accompanied the 1953 British Everest expedition, he strapped on a pair of crampons and climbed with his team mates into the Khumbu Icefall. He was approaching Camp 1, at the bottom of the Western Cwm, when the earthquake struck. It would have been a frightening place to be in those circumstances. In a deep glacier-clad valley hemmed in by the ice-riddled masses of Nuptse and Everest’s West Shoulder on either side, it must have seemed a near certainty that an avalanche would wipe them out, or a crevasse would open up and swallow them like a whale snacking on krill. With the route through the icefall destroyed beneath them, and regular earth tremors turning it into a minefield, they were trapped at Camp 1 for two days awaiting rescue by helicopter. Avalanches fell constantly, something mountaineers get used to in snow amphitheatres like Everest’s Western Cwm, but in this case the regular aftershocks made them far less predictable. “Almost everybody thinks we are going to die,” says Tom. Despite the hostile environment, I watched this section with reverence. The beauty of the mountains was captured perfectly in the photography, and I couldn’t help feeling wistful. I have yet to climb into the Western Cwm myself, having been denied by events last year, and dream of returning one day. Camp 1 was even a place of tranquillity compared with what had been happening at Base Camp. Nineteen people died when a huge avalanche wiped out the central part of camp. The documentary featured the following short YouTube clip filmed by a member of the Ascent Himalayas team, who were camped on the periphery of the avalanche zone. “At Camp 1 we have no idea what is happening. The earthquake has cut us off from the rest of the world,” says Tom in the documentary. His team had been camped right in the middle of the zone. Three of their Sherpas, Kumar, Pasang Temba and Tenzing were killed, and had the rest of them not been at Camp 1 there would certainly have been more fatalities. After his rescue Tom finds his tent buried beneath a mound of snow and rubble – a tatter of broken poles and nylon, and barely recognisable. “I would have been so dead,” he says, gazing at the wreckage. 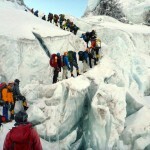 The second half of the film examines the affect of the earthquake beyond Everest. Tom travels through Kathmandu, passing teetering buildings and interviewing those who have lost family in the tragedy. He visits a vast tented camp on a golf course, inhabited by people whose homes have been destroyed. There is a touching moment when one of them offers him food. Knowing how much they have lost he is reluctant to accept, but they insist. What he said next will have struck a chord with anyone who has visited Nepal and been affected by the hospitality of its people, and their resilience in the face of hardship. He travels with a Gurkha aid convoy to one of the remoter regions of Nepal affected by the earthquake. In one of the villages along the road they pass a school and stop to investigate. No sooner are they out of the vehicle than they are besieged by smiling kids. The school building has been completely destroyed, and they learn that eight classes are taking turns to share a single tent with two wooden benches. They visit the village of Priti, where there is a British Army camp. 1400 houses in the surrounding area have been surveyed and, with aftershocks continuing, not a single one is considered safe to live in. The Gurkhas have built a two-room school and are showing the villagers how to assemble earthquake-proof buildings of their own. It would be impossible for me to review a documentary about Everest without moaning about something, and there was one aspect of the film I was less comfortable with. I know it makes gripping viewing, but why do documentary makers feel it’s acceptable to visit grieving families and stick a camera in their faces? Tom visited the widows of two of the Sherpas who died in the avalanche, Tenzing and Kumar. The footage was very moving. Both were in tears and spoke powerfully of their grief. Unsurprisingly so soon after the tragedy they had still not come to terms with their loss. Tenzing’s widow had this to say. Kumar’s widow spoke of the moment she heard of his death. Heartfelt and powerful as this is, it doesn’t tell us anything we don’t know, and to put it bluntly it’s exploiting somebody else’s personal tragedy for the purpose of entertainment. Grief is not a Nepalese thing, nor even a Third World one. It affects us all, rich or poor, old and young, black or white. If you visit anyone who has lost their closest friend so soon after their loss, they will feel like their world has been torn apart and their heart ripped out. They are going to find it difficult to put what they are feeling into words without breaking down. It was nice of Tom to visit the widows of Kumar and Tenzing, because he knew them and had memories of them he could share. It is likely their wives would have appreciated that. But please, spare them the cameras. This is just one gripe, and it’s one that blights many documentaries, not just this one. Otherwise I felt it was a sensitive film, mainly because it showed us what happened, without trying to promote any particular message. Each viewer would have reached the end having formed their own impressions of what was important and what was not. There is even a rare glimpse on camera of elusive and reclusive expedition operator Henry Todd, known affectionately as The Toddfather. One person who enjoyed watching the documentary was Tom Martienssen himself. Here’s what my Twitter timeline looked like shortly after the broadcast. 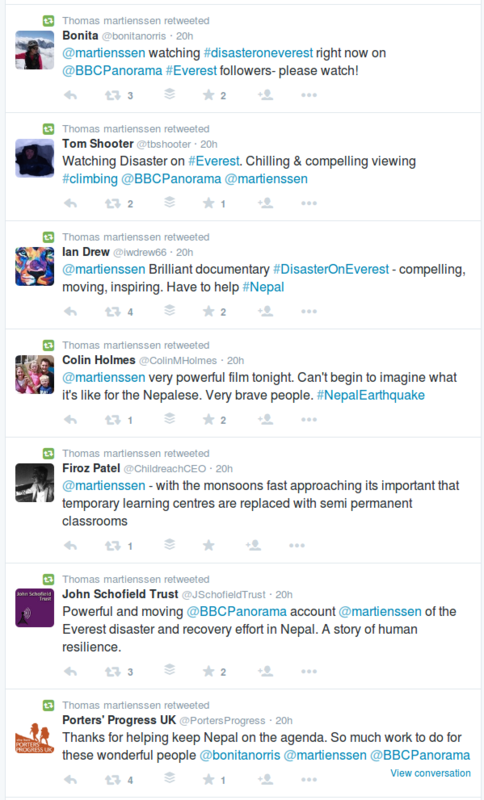 Yes, that’s right, that’s Tom Martienssen retweeting his own praise. Not everybody enjoyed it quite as much as he did though. In the interests of balance, here’s what fellow journalist Ed Douglas had to say about it. Feeble Panaroma on Everest. More like Bear Grylls does relief aid. I think Ed was expecting something hard-hitting, but then he’s one of the few people qualified to produce something better. As a mountaineering historian and expert on Nepal his articles have been a shining beacon of light among the avalanche of drivel that has passed itself off as Everest reporting over the last few years. He’s right, there were a lot of issues that weren’t tackled, but then it’s not possible to go into too much detail in a half-hour documentary. 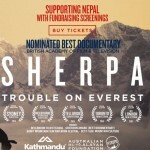 He will have learned approximately nothing from watching this one, but for most people who know very little about Nepal, or know enough to love its mountains and people, it’s likely they will have got something out of it, and ended with a better understanding of the challenges facing the Nepalese. Better still some people may have more of a yearning to travel there. If you live in the UK then you still have five more days to watch it on the iPlayer, and for everyone else I expect it will be picked up by the BBC World Service at some point. ← Is disaster reporting becoming too violent?